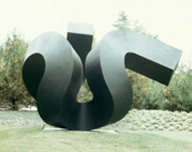 You can continue exploring the arts through the campus at Northwestern Michigan College, thanks to the development of a major collection of outdoor sculptures. These unique, thought-provoking sculptures are located in the immediate Dennos Museum Center area as well as throughout the college’s campuses. Primarily focused on works by noted Michigan sculptors, the collection also includes works by artists of international stature. Learn more about these gifted artists and their outdoor works by clicking on the links below. Maps of these sculptures are here.